Overlooking the Gulf of Mexico for 100 years, stately Hotel Galvez has withstood devastating hurricanes; lawless post-prohibition days when casinos, bootleg booze, and prostitution flourished; the good times and bad. Its elegant architecture earned it the sobriquet "Queen of the Gulf" shortly after opening, and the nickname stuck. Today it's a treasured Galveston landmark, recently refreshed and warmly welcoming. A member of the Historic Hotels of America, Hotel Galvez is a four-star AAA property. 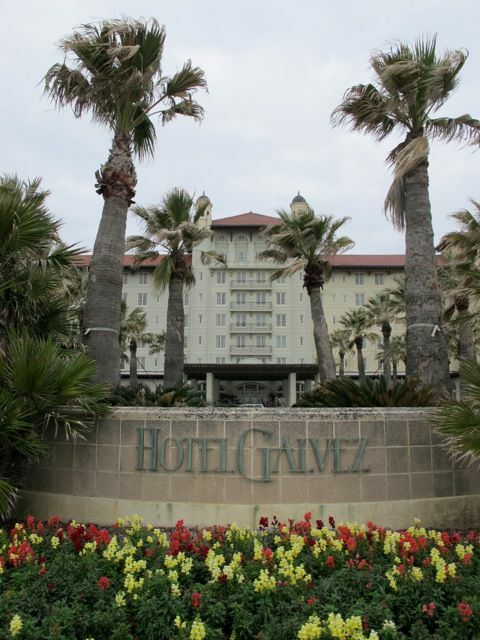 With its splendid restaurant, spa and meditation garden, outdoor pool, and the beach across the highway, Hotel Galvez remains an island haven for visitors who travel from Houston and beyond. The 224 rooms, including six suites, at Hotel Galvez are generously sized, with a firm Simmons HealthSmart king-sized mattress and soft pillows. Good lighting, a work desk, free wi-fi, an iPod dock, and a Samsung flatscreen TV with dozens of channels including Showtime make it a fine space for work and play. Bathrooms are simply functional. A magnifying mirror and dimmer light are welcome amenities, as is the Texas-sized waffle weave bathrobe provided. Spa-inspired guest rooms on the sixth floor are allergy resistant thanks to the Wyndham ClearAir cleaning process. Bernardo's is Hotel Galvez's all-purpose restaurant. Flooded with light thanks to tall arched windows, it's an airy, elegant space. The restaurant is particularly known for its Sunday brunches, when a bountiful buffet is laid out for guests. Start perhaps with some fresh Galveston Bay oysters, shrimp, and crab legs. Or smoked salmon on a fresh bagel. Separate stations whip up eggs and pasta dishes to order. A bourbon-glazed ham and a prime rib warm under heat lamps, tempting carnivores. Salads and fruit sate light eaters or those leaving room for the Sunday brunch dessert. Sweets — a cornucopeia of cakes, pies, cookies, petits fours, brownies, mousse, truffles, trifles, and chocolate-chip-studded bread pudding — have their own section to make mouths water. Hotel Galvez hosts more than 100 weddings a year; the largest space can accommodate up to 300 guests, but its thick columns make room design a challenge. The loveliest spot for a wedding reception is the Veranda, with windows overlooking landscaped grounds. Couples who have their hearts set on a beach wedding can count on Hotel Galvez making that dream come true on a sandy spot beyond the seawall. Hotel Galvez is managed by Wyndham hotels and offers couples the brand's "Sweet Escape" Package. It includes overnight accommodations for two adults, a chilled bottle of Domaine Chandon Champagne, chocolate-covered strawberries, and breakfast for two from either room service or the lobby cafe. Wyndham also posts a "Honeymoon Exclusive" package that gives couples who book five nights at any of its hotels two additional nights free at the same property during their stay. Guests are welcome to use the heated outdoor pool at Hotel Galvez, which has a swim-up bar and hot tub. It's surrounded by loungers and shaded cabanas. Hotel Galvez boasts the island's newest spa (established 2008). It features eight treatment rooms, including massage rooms, hydrotherapy room, two Vichy showers, a Swiss shower and a couples massage room that offers four-handed massages. Afterwards, reflect on your good fortune and well-being in the Meditation Garden. There's also a beauty salon and fitness center on the premises as well as a Spa Boutique where some of the emollients are sold. If you want to get out and explore Galveston, the hotel has complimentary bikes to use (the island is essentially flat, so getting around is easy). Just up the road is a vendor who rents bikes and takes visitors out on riding tours. All of Galveston is accessible from Hotel Galvez; having a car or bikes makes attractions easy to reach. If you're without wheels, hop the complimentary shuttle to sister hotel The Tremont House. It's downtown, and an easy walk to the Strand and harbor. Culture and entertainment await at the Grand 1894 Opera House. also downtown. At the port are tourist attractions and bay tours. Beach lovers and birders will want to visit the East End. Those with an interest in aviation ought to visit the Lone Star Flight Museum; up-in-the-air experiences can be booked. Moody Gardens, the city's largest attraction, has everything from an aquarium and iMax theater to a rainforest pyramid and golf course. Soundproofing could be better on guest floors. Conversations between chattering chambermaids in hallways and next-door neighbors can disturb sleep. And you may find yourselves in a room with two windows overlooking the Gulf. One has blackout shades. The smaller one has none at all. On the "bright" side, you may get to witness a magnificent dawn over the water. In standard rooms, a safe is provided, but no minibar or fridge. That Hotel Galvez has lasted a century is a testament to the visitor experience it delivers. It's obvious that local residents revere this landmark in their midst and take joy in spending time here. Even if you can't stay overnight, drop in for a drink in the lobby bar, salvaged from a handsome wooden backdrop from the Galveston Club. In honor of its centennial, Hotel Galvez opened a Hall of History on the lower level. Documents, images, and memorabilia reveal this grande dame's storied history. As is common in the travel industry, the writer was provided with complimentary accommodation and meals for the purpose of reviewing those services. While it has not influenced this review, About.com believes in full disclosure of all potential conflicts of interest. For more information, see our ethics policy .